As you go off to fight in the Holy Wars, please do not forget a few things. Say farewell to your family, pack some extra underwear, and belt on your Antiqued Templar Dagger. If you bring anything, make sure to bring this dagger! This elegant crusaders dagger is made from stainless-steel. The hilt of the blade is made from cast metal and possesses a curved crossguard and a leather-wrapped handle. At the center of the crossguard is a golden icon depicting a shield with a cross on it. In the middle of the handle is a metal band that displays a cross. The round, dark metal pommel of this dagger is also decorated with a cross. The scabbard in which this dagger is kept is ornately decorated with metal caps on the tip, which is decorated with a cross, and the part the blade enters, which is decorated with a face and swirling vines. 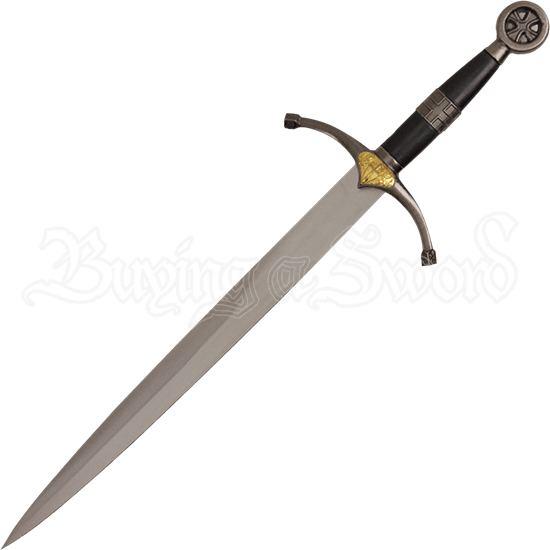 The perfect addition to any collection, this medieval dagger is great for reenactments, cosplay, and Ren Fairs. Give it as a gift to a friend or loved one, or add it to your personal collection!